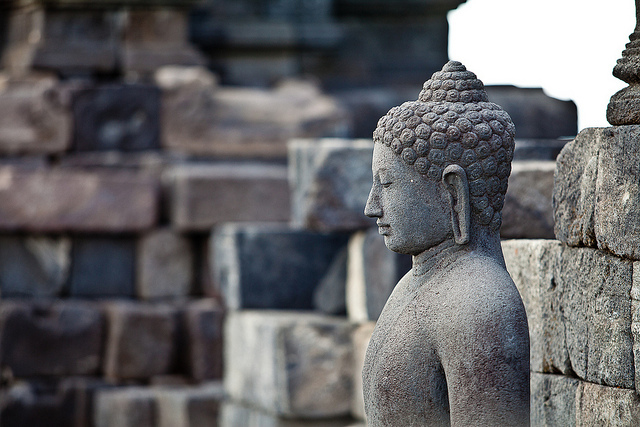 Buddhism is not a Religion—It’s Something Much Better. Home » Health » spirituality » Buddhism is not a Religion—It’s Something Much Better. I get plenty of comments when I say that I’m not a religious person, but I am a practicing Buddhist. Although Buddhism is known worldwide as a religion, for me it is not. Frankly, I used to perceive it as one, before knowing anything about it and delving into its culture. To start off, the word religion means “a system of faith and worship” and “the belief in a superhuman, or god with power.” After visiting India and Nepal, and observing the Buddhist complex, I came to notice that Buddhism is neither a system of faith, nor a god-based institution. Buddhists do not consider the Buddha as a supreme god. For them, he is a man like any other man who’s walked on the earth. Nevertheless, Buddha untangled the reasons of suffering and offered us a concrete way of getting out of them. And although he did offer the world teachings about how to get unstuck from samsara, he insisted that he wanted no worship or praying. All he asked for is that we must examine his teachings first, and if they do resonate with us, then we practice them. If not, however, we have the utter freedom to leave them. Although I have watched rituals and ceremonies being held at monasteries, I’ve been told that they’re not in any way worship-based. The so-called “worship” that we might see is one that is offered as a way of showing respect and thankfulness to the man who exhibited the truth. Even the prayers that we hear are ones that read compassion, kindness and love to all sentient beings, without any exception. If we look more closely at Buddhism, we can even ascertain that there is no leader in the culture. Dzongsar Khyentse constantly talks about how the Dalai Lama is a secular leader for the Tibetan community in exile and a spiritual master to many people all over the world—and not merely for Buddhists. He insists that there is no authority in Buddhism with the power to decide who is a true Buddhist and who is not, or who is punishable and who is not. If Buddhism isn’t a religion, what is it then? The way I see it, Buddhism is a way of life—it’s a philosophy and a truth that simply represents how things are in life. I must admit (and I’m not ashamed to claim it) that Buddhism has helped me understand the religion I was brought up with, as well as all the other religions in the world. Before being introduced to Buddhism, “holy books” were on par with the Chinese language to me. I couldn’t understand why I was supposed to pray, to attend religious ceremonies or to follow a spiritual leader, without true conviction or belief for what they’re saying. Before Buddhism, I was co-dependent on “God.” I constantly searched outside of myself, and I believe this is why I never found myself. Buddhism helped me look inward. It taught me independence and self-awareness. Through it, I began to understand how the world ticks. It helped me look at myself and take responsibility for my actions, thoughts and emotions, rather than taking refuge in a supreme god. With Buddhism, I came to finally understand that God isn’t a judgmental man who lives in the clouds. I stopped this duality between God and myself, and I figured out that God is in everyone (and everything and everywhere). It is not something that is outside of us or something we cannot reach—it is in us. So you might ponder the question—why is it worth looking into Buddhism or practicing it? I utterly believe to each their own—however, I also believe that it is never wrong to live with an open heart and an open mind which expands our knowledge and raises questions in our heads. It’s worth understanding Buddhism, because the final outcome of its purpose is not something that is beneficial to itself—the benefits are for our own sake. The benefit is that we will actually understand the truth of life, our existence and ourselves. The Buddha didn’t tell people what they wanted to hear—he simply opened their eyes to the truth of life. Are you ready to hear it?